The picture below shows some fancy wings that I’ve added to protect the inboard side of the limb from the crushing effect of the bundle. The rope spring gets a pretty good squeeze on the limb. The wood needs a little help to stop it from breaking down over time. I managed twelve sloppy shots before it became evident the exposed wood under the bundles was disintegrating in a plethora of longitudinal cracks. The compressive force of the spring is more than hickory alone can bear. Hence the curved wings. Also note the new U bottom for the socket. This makes the limb section 1″ deeper than it was before. This added section will allow a limb with a deeper cross section at its base for extra rigidity. 7 1/2 degrees is the minimum amount of washer rotation allowed by the vernier hole pattern that locks the washers in place. In this next video I am still able to manually pull the limb off the stanchion. With another 7 1/2 degrees of rotation applied to all four washers, this will barely be possible. Another 7 1/2 degrees after that it will be time to haul out the chronograph and clock some velocities. Yet another 7 1/2 degrees (22 1/2 beyond the level in the video) and past experience suggests the bundles will just about be maxed out. In this next video the string has been shortened by about an inch. The extended string oscillation at the end of the shot is largely just a characteristic of inswingers. The string could still do to be shortened a bit more, but that can wait until the torsional adjustments on the washers are completed. If this video is played on slow, the string can be seen to extend out beyond the end of the stock. Without a stock extension this long the string has a tendency to foul itself on the underside of the stock. The last reading at 39″ is the maximum I can go with the dynanometer attached. When we get to the longer draw lengths, I will have to put a spring scale on the end of one of the cocking levers and figure it that way. These readings are with a string that is perhaps an 1 1/2″ too long and springs that have not yet been torsion adjusted to their final level. 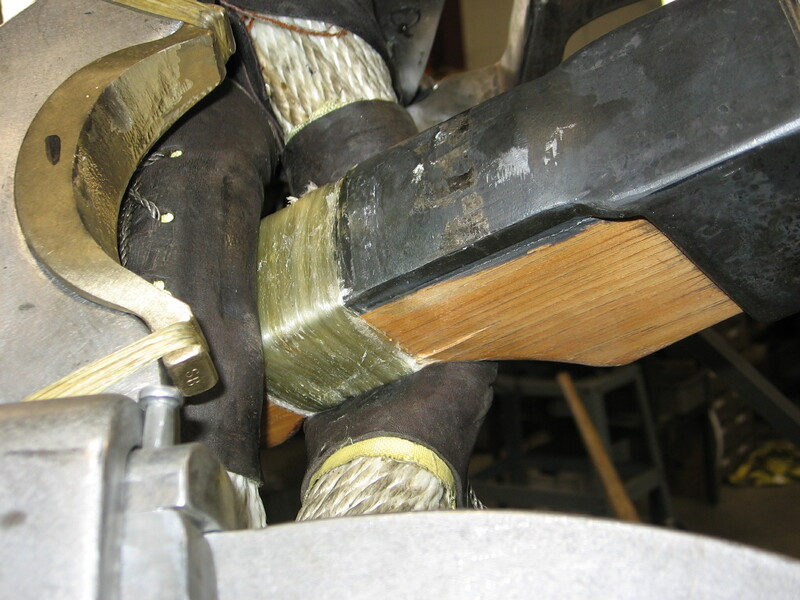 In the photo below we can see some minor cracking from the massive compression being applied to the wood fibers by the bundle. 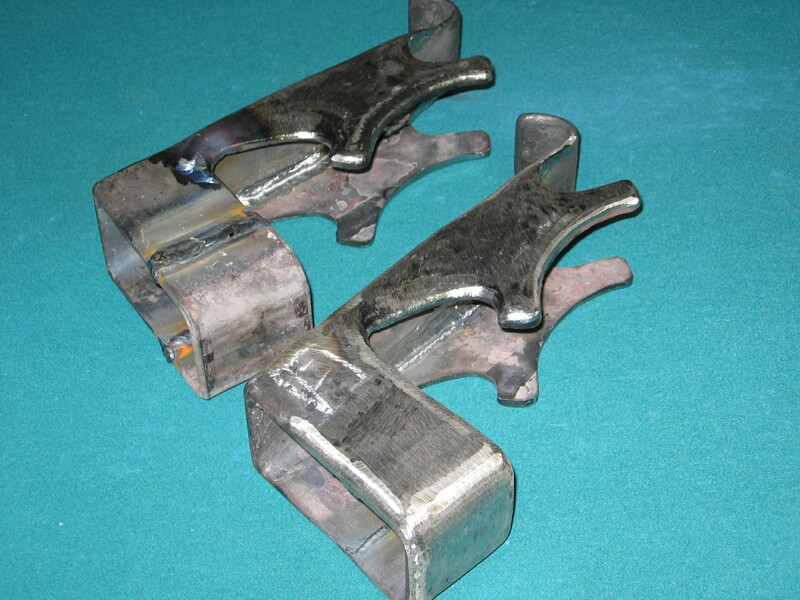 In this area, the actual strength of the limb assembly is all in the spring steel limb irons, so, other than the garroting effect of the bundle on the limb, I am not particularly worried about their overall integrity.